Research suggests strongly that more children's books in the home can do so much to eradicate the effects of other disadvantages. And when we know they aren't in the home, we need to bring the very best to the home away from home: the classroom. In other words, children's books continue to be our brightest hope for educational equity, and the more quality picks on the shelves, the merrier. This speaks to the magic of collection building. One good book is transformative. But there is something about the relationship of books on a shelf, next to each other. The arrangement is like neurons firing, from one to another; every connection matters. I think of the yearly round-up as its own special collection; if a child were to read all these books in the course of a year, how would they be changed in what they know, in how they act, in what they value? How would they form relationships to books, authors, illustrators, each other? Because that's all real learning boils down to: content, change and relationship, and these selections will foster growth in all those areas. Books are chosen with read-aloud, classroom use, kid-appeal and excellence in writing and illustration top of mind. Here we go, thirty-one in honor of every day of the first month of the New Year! First, my picks for the highest award in American children's book illustration, The Caldecott Medal. My fingers-are-crossed hope for this year is that all the Caldecott Awards go to books that represent Latinos, because this year, it just so happens all of these books absolutely deserve to win and also just so happen to feature Latino characters. 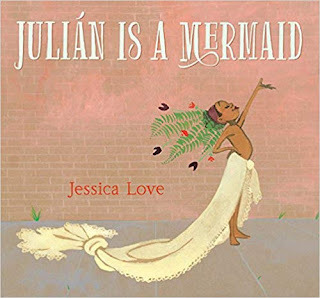 In Julián is a Mermaid by Jessica Love (Candlewick), young Julián observes gorgeous costumed mermaids en route to the Coney Island Mermaid Parade, and naturally this unleashes his fantasy of joining them. He imitates them with an elaborate and imaginative homemade costume. Will this meet with his grandmother's disapproval? While this is a powerful story of unconditional love that every child deserves to read (and experience), I confess it is my favorite because it is just so beautiful. SO BEAUTIFUL. The cover is charming, yes, but when you crack it open...WHAT! Those lines. The flow. The colors. It's DREAMY. It's LUCIOUS! And the endpapers. I've been giving a lot more attention to endpapers during story times since illustrators seem to be giving them more attention of late as well. Sometimes they are wrapping paper for the gift of the book and other times they are a bonus gift, as is the case here: a row of grandmothers at a swim class with Julian under the surface, and finishing with the same grandmothers as mermaids with our victorious hero in tow. Intergenerational, urban and urbane, developmentally appropriate and reflective, loving, LGBQT friendly and celebratory of All Things Imagination, this book makes a major splash. 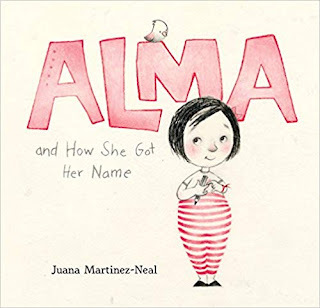 In Alma and How She Got Her Name by Juana Martinez-Neal (Candlewick), Alma Sofia Esperanza José Pura Candela wonders why she has such an unwieldy moniker and learns that her name was inspired by a conglomeration of relatives worth remembering, each of whom is introduced here. There is a piece of each of these ancestors that lives on in Alma, combining to make her one of a kind. The uncluttered and refined line illustrations bring to mind children's book masters of the past (think Martha Alexander). 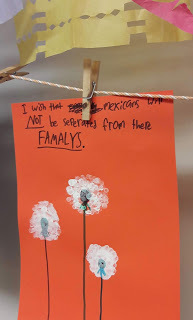 Mostly I am so excited by the potential for classroom conversations this will inspire about names and relatives and how who we are can have so much to do with where we come from. This book invites family, ancestry and pride. Dreamers by Yuyi Morales (Neal Porter Books/Holiday House) is based on the real immigrant experience of Mexican author Yuyi Morales and her young son. It does an sensitive job of depicting the foibles of someone making a way in a new country and offers one of the most impactful visual celebrations of the power of reading and libraries for anyone trying to find their place in a culture. 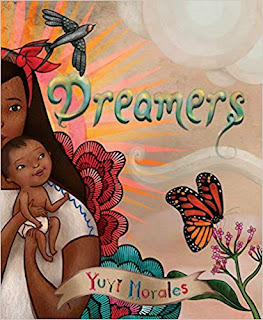 The illustrations among the bookshelves pay tribute to the titles that transformed the Morales' lives and earn this book a place in the collection of every and any children's book enthusiast. The Caldecott is not a prize that is supposed to recognize career contribution, but if it were, I can't imagine an author more deserving of inclusion in the canon of that award. Her palette, surrealistic style and consistently hopeful and often humorous contributions are consistently distinctive and distinguished, and this is no exception. Her topic is timely and necessary for classrooms and her treatment is truly healing, inspiring, victorious. 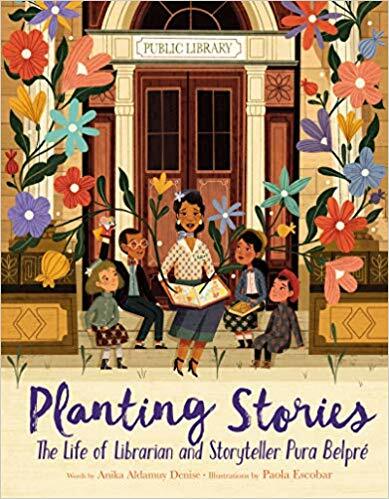 And heads up, fresh out of the gate for 2019, we have the glorious Planting Stories: The Life of Librarian and Storyteller Pura Belpré by Anika Aldamuy Denise, illustrated by Paola Escobar (Harper), a picture book biography about the woman who inspired the Pura Belpré Award given to "a Latino/Latina writer and illustrator whose work best portrays, affirms, and celebrates the Latino cultural experience in an outstanding work of literature for children and youth" (which, incidentally, Yuyi Morales has garnered several times). 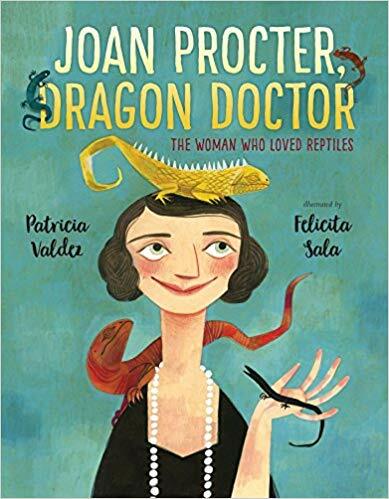 Any discussion of children's book awards with children this season would be enriched by a sharing of this vibrant picture book biography. 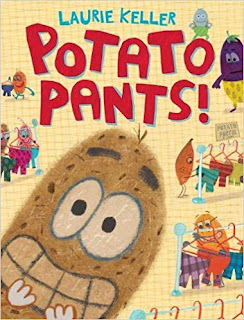 Potato Pants by Laurie Keller (Henry Holt). Potato is so excited to get new pants, he's dancing the Robot (or Po-Bot, as the case may be)..but troublemaking Eggplant has purchased the last pair! Eggplant is being blamed for problems, but does Potato play a part? Under the skin, this is a good pick for modeling genuine apologies and conflict resolution. The varied layout is busy and exciting, and I can't imagine anyone not wanting to design their own pair of potato pants and doing a little dance after reading. I love children's books that children actually love and that matches their energy. This wins. For more zany fun in the spud department, check out the seasonal Meet the Latkes by Alan Silberberg (Viking). A couple of alphabet books made the list this year. 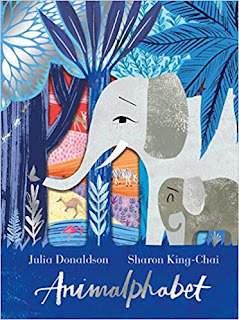 Though without a particular narrative line, I literally gasped when turning pages of Animalphabet byJulia Donaldson, illustrated by Sharon King-Chai (Dial), with die cut pages and colorful, supersaturated illustrations. While the alphabet offerings may not be novel (a is still for ant), the processional storytelling is, with questions prefacing each next page that invites active guessing from the audience and the eye taking a journey from corner to corner to take it all in. 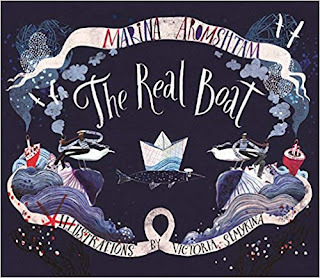 The pages are delicate and may be better suited to private collections, laps and teacher-led story times, but absolutely still worth the purchase for the sheer pretty of it. Fans of Charley Harper and Petr Horacek will approve. 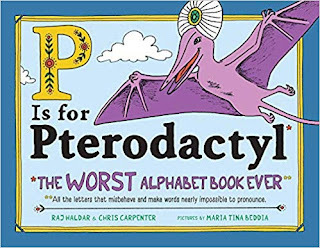 P is for Pterodactyl: The Worst Alphabet Book Ever by Raj Haldar (also known as the rapper Lushlife) and Chris Carpenter, illustrated by Maria Beddia (Sourcebooks) plays on the preposterousness of our language (O is for Ouija, N is not for Knot, T is for Tsunami, G is for Gnocchi), and has a funny full-page picture for every letter but content that can be shared with older children just as well. Though any child will benefit from the vocabulary, this book underscores the challenges any English language learner might encounter, and might be used to underscore their achievement just as readily. Very clever and well executed. 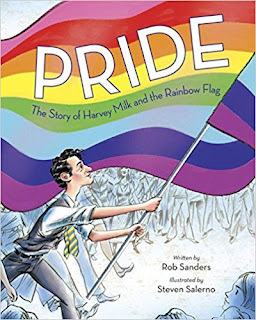 Pride: The Story of Harvey Milk and the Rainbow Flag by Rob Sanders, illustrated by Steven Salerno (Random House), which gives a very excellent explanation of the ubiquitous rainbow flag as well as a well-written, straightforward and poignant introduction to LGBQT history and one of it's heroes for young audiences. Pretty essential and pretty darn wonderful. There was a time in this country when we made things. A LOT of things. 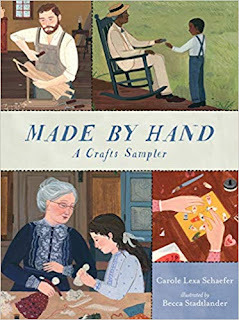 Made by Hand: A Crafts Sampler by Carole Lexa Schaefer, illustrated by Becca Stadtlander (Candlewick) is a celebration of that history. Acrobatics of poetry and historical fiction employ vocabulary like crimper. Plane. Churn. Sampler. Bandolier. I was won over from the first description of the invention of the Terrestrial Globe, borne from a passion I have not so convincingly experienced in print since the reading of Jacqueline Briggs Martin's Snowflake Bentley. 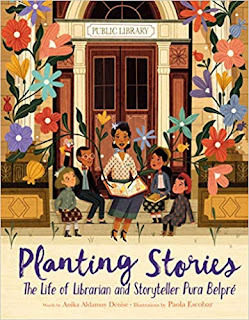 Back matter provides detailed explanations of which parts of each vignette are fiction and which are nonfiction, and photos of the real artifacts, while well-matched folksy illustrations grace the rest. 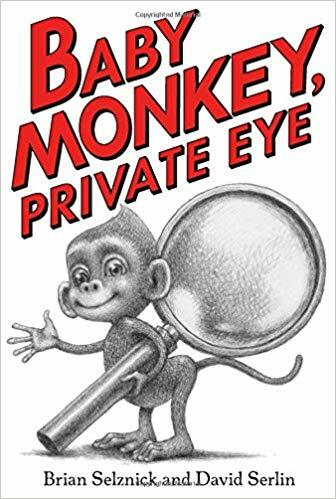 Highly original and making amends for years lost by removing shop and home economics from school curriculums, this is an erudite, complex, genre-bending book better suited to older children, and even then, maybe not every child. But the child for whom it is suited will revisit this book, be inspired by this book, will time travel with this book. Though Lois Ehlert's Hands remains one of my favorite children's books about making things, this year provides many other complimentary titles: With My Hands: Poems About Making Things by Amy Ludwig VanDerwater, illustrated by Lou Fancher and Steve Johnson (Clarion), Made by Maxine by Ruth Spiro, illustrated by Holly Hatam, and Kids Cooking: Students Prepare and Eat Foods from Around the World by George Anacona (Candlewick), which suffers from lack of recipes (though easily searchable online) but has delicious, active photographs of real children preparing food. 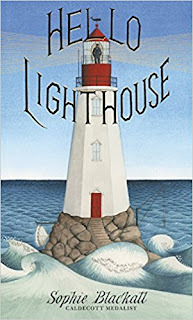 Hello, Lighthouse by Sophie Blackall (Little Brown). I confess, when I saw this book, I thought, regionallllll. How is this going to speak to the landlocked midwestern kids I teach? WRONG! Reminder/note to self: often the best kind of books are not the books that speak to one's own experience, but invites us into a new one. What happens when someone is sick and they live in a lighthouse? How do they get supplies? How does someone come to visit? Can it withstand tidal waves? All questions are answered in the context of the story of a lonely lighthouse keeper who finds his bride, his family and an unexpected future from the tower. The x-ray illustration of the lighthouse's interior will inspire children to imagine houses and architectural futures with a vim not seen since Daniel Pinkwater's The Big Orange Splot, In fact, beyond inspiring indefatigable interest in lighthouses and imaginings of living in one, this is one of the most romantic and graceful children's books I have ever come across. Of course, now Hello, Lighthouse must headline a storytime that includes the classic Tim All Alone (or any of the Tim books) by Edward Ardizzone, and the new gem Ocean Meets Sky by Terry and Eric Fan (Simon and Schuster) (about a boy who takes a magical boat journey to honor his grandfather, absolutely ethereal and stunning, like a dream that was captured in the bindings of a book), A First Book of the Sea by Nicola Davies (always exceptional for science writing), illustrated by Emily Sutton (Candlewick), and The Real Boat by Marina Aromshtam, illustrated by Victoria Semykina (Templar) (which is a January 2019 release, but I don't care, this story about a paper boat who is trying to become a real boat is gorgeous and you need to know about it now). Oh, what the heck. Bag whatever you were planning, teachers, and embark on a unit about the sea, sea travel, lighthouses. There's so much treasure in the sea. 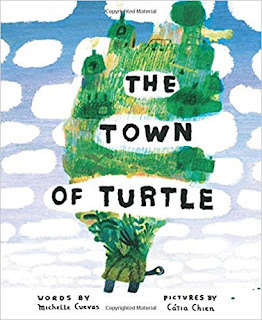 Also on the subject of reimagining life's possibilities, we have The Town of Turtle by Michelle Cuevas, illustrated by Catia Chien (Houghton Mifflin Harcourt). "Turtle spent a lot of time in his shell. It was very dark inside--as dark as the inside of a closed flower, as dark as the underside of a bell." After dreaming about a better home, Turtle embarks on renovations to his shell, as colorful and outlandish as his dream...and his vision grows and grows, until it invites others to join him. I always get a little grumpy when recommending anything illustrated by Catia Chien, because ever since The Sea Serpent and Me, I just don't understand why she doesn't win everything. Why? WHY?!? Whatever. She's too good for this world. That's why she creates otherworldly books like this one. 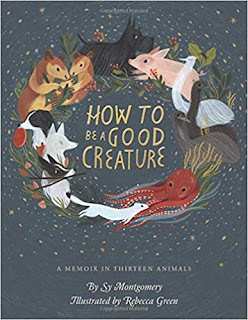 How to Be a Good Creature: A Memoir in Thirteen Animals by Sy Montgomery, illustrated by Rebecca Green (Houghton Mifflin Harcourt) is not a picture book per se and probably better suited for ages 10 and up, but since I want to buy a classroom set of thirty, it seems like a title I ought to share. Less of a book about animals and more about a life with animals, we follow the author, a naturalist and adventurer, through her encounters with the natural world. Black and white full-page plates charmingly accent the writing. 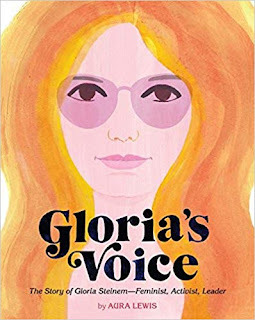 It is a difficult to write a memoir for children (I know), but when it is done well, it can offer a blueprint for future possibilities for the reader. I am sure many animal lovers---and strong-willed girls---will find inspiration and empowerment in the author's unconventional choices. Future naturalists will also delight is other recent offerings: Look at Me! How to Attract Attention in the Animal World by nonfiction super-team Steve Jenkins and Robin Page (Houghton Mifflin Harcourt), the generous and elegant Sing a Song of Seasons: A Nature Poem for Each Day of the Year selected by Fiona Waters, illustrated by Frann Preston-Gannon (Nosy Crow), Little Fox in the Snow by Jonathan London (famous for his Froggy series), illustrated by Daniel Miyares (Candlewick), the very interesting Under the Canopy: Trees Around the World by Tris Volant and Cynthia Alonso (Flying Eye), and Moon by Alison Oliver, in which a little girl finds respite from her over-scheduled life by adapting to some wolfy ways, illustrated with vintage flavor and a very fresh follow-up to last year's Caldecott winner Wolf in the Snow by Matthew Cordell. 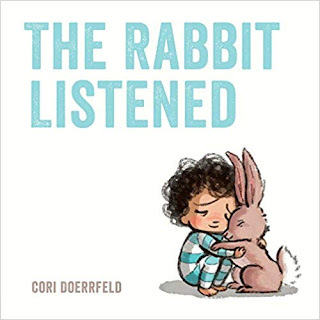 The Rabbit Listened by Cori Doerrfeld (Dial). I bristle at didacticism in children's books, and gosh golly isn't it enough of it out there telling kids to Be Kind and Be Welcoming and all too often with the storyline of a limp noodle and probably the long-term efficacy of the "Just Say No" campaign. With renewed vigor now that it is coming to light the number of bad eggs in our box, the industry is burgeoning with titles that decry bullying and emphasize empathy with a capital E, though we have been trying since 1944 and Eleanor Estes' The Hundred Dresses (and if that didn't cut the mustard, I don't know what would). So why did I re-read this book about seven times? The human condition requires loss and disappointment, certainly for children, too; I think the only thing worse than the event of loss is the well-meaning ding-dong who says or does exactly the wrong thing. So many people rightly fear being this ding-dong and so don't do anything at all, which is even worse. Enter: the rabbit. When a flock of crows destroy a block tower, the child is devastated. Different animals come to offer solace. The chicken wants to talk-talk-talk about it. The bear wants to get mad. The ostrich sticks its head in the sand and pretends it never happened. The hyena wants to laugh it off. And the snake insidiously hisses a suggestion of revenge. It is not until the rabbit comes and holds space does the child's healing begin, and dreams of a new, better edifice begin to formulate. The strength of this book is that it does not contend only with the person who is experiencing pain but the person who is offering support. The expressive illustrations make artful use of negative space and perfectly compliment the story (and yay, there is a story! ), showing children from an early age that not only do we not owe it to anyone to feel the way someone else would like us to feel, it is not always our charge to fix but only to be present. This might go far to ensure that they do not grow up to be obnoxious in the face of somebody else's adversity in years to come. Hush up and be somebody's rabbit. A very valuable lesson indeed. 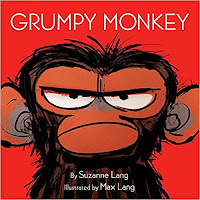 Also in this very same vein is the more comical Grumpy Monkey by Suzanne and Max Lang (Random House), which follows a similar story arc of animals not just letting monkey get his mad on. More emotions are wrangled via the masterful Molly Bang, author of the popular When Sophie Gets Angry...Really, Really Angry who has a new book in that series, When Sophie Thinks She Can't, addressing lack of confidence and feelings of competition with others. 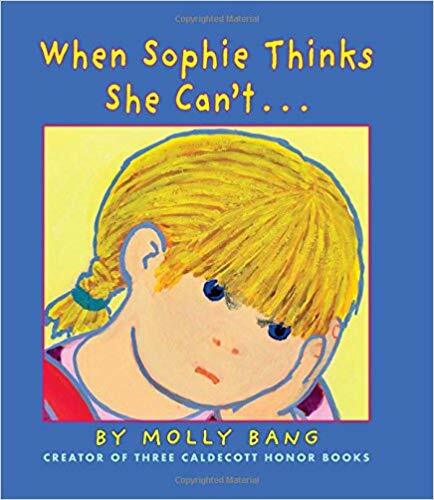 Poor Sophie. She needs Rabbit to listen. All right, all right. Like picture books with cats in them, I probably like these kinds of feely-books more than I'm willing to admit. 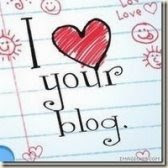 If you do, too, visit this excellent blog, Books That Heal Kids. Speaking of books with cats. 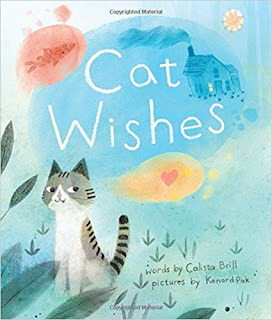 In Cat Wishes by Calista Brill, illustrated by Kenard Pak (Houghton Mifflin Harcourt), a cat captures a snake and is granted three wishes in exchange for its release, only the cat doesn't really believe in wishes. What would he wish for if he did? To his surprise, the wishes seem to come true, culminating in a human with a wish of her own. This book is a bit of a "sleeper," but a keeper for it's lovely story structure and sweet illustrations, great for teaching beginning, middle and end and story sequencing. 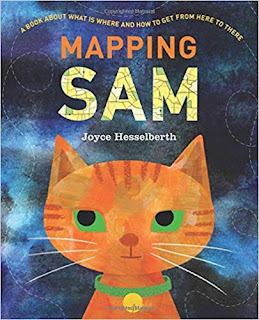 And if you'd like more feline steps to follow, check out Mapping Sam: A Book About What is Where and How to Get from Here to There by Joyce Hesselberth (Greenwillow), a nifty general overview to all kinds of maps, labels and blueprints. 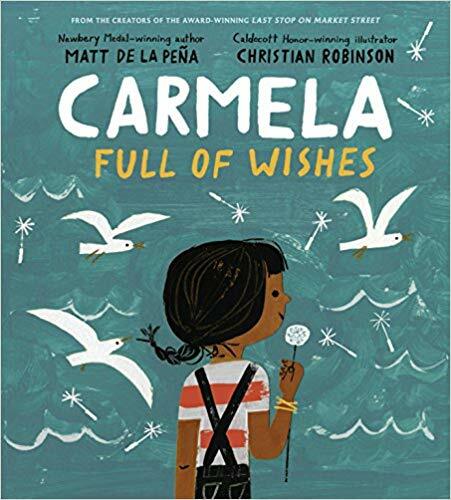 A new offering from the multiple-award-winning team who brought us Last Stop On Market Street, we have Carmela Full of Wishes by Matt de la Pena, illustrated by Christian Robinson (Putnam), a provocative story of a little girl from a migrant family who has to think of just the right wish to make on some valuable dandelion fluff. When her flower is destroyed, her cantankerous big brother steps up to show her there is more than one wish that come true for her future. Complex and subtle themes run deep in this family story, and I defy you not to become enamored with Robinson's friendly, geometric illustration style that hearkens to the great Ed Emberley. My school was fortunate to have an author/illustrator visit from this team, springboarding 2nd and 3rd graders into exploration of simple landscapes using geometric shapes, crafts involving wishes that ended up being extremely personal and poignant, creation of Mexican papel picado and discussions of what it is like to come from somewhere else (a subject on which my Chicago Public School students have plenty of prior knowledge). Other new picks that will elicit discussion and appreciation of global and multicultural experiences include the sumptuously illustrated Islandborn by Junot Diaz, illustrated by Leo Espinosa (Dial), A Big Mooncake for Little Star by Grace Lin (Little, Brown), The Day War Came by Nicola Davies, illustrated by Rebecca Cobb (Candlewick), Can I Touch Your Hair? : Poems of Race, Mistakes and Friendship by Irene Latham and Charles Waters, illustrated by Sean Qualls and Selina Alko (Carolrhoda) and the beautifully written Three Balls of Wool (Can Change the World) by Portuguese author Henriqueta Cristina, illustrated by Yara Kono and translated by Lyn Miller-Lachmann (Enchanted Lion, published in partnership with Amnesty International). 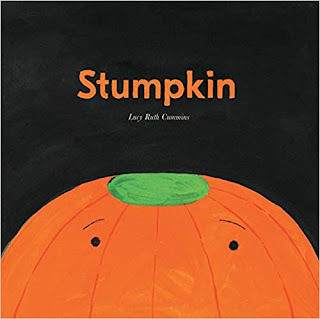 I always try to add one or two really strong seasonal read-alouds to my collection every year, and this year I chose Stumpkin by Lucy Ruth Cummins (Athenaeum). Stumpkin notices he is different, missing a stem, and watches forlornly as the other pumpkins are chosen over him from the grocery shelf, reappearing as jolly jack-o-lanterns in the building across the street. Finally, it is Halloween. What will be his fate? 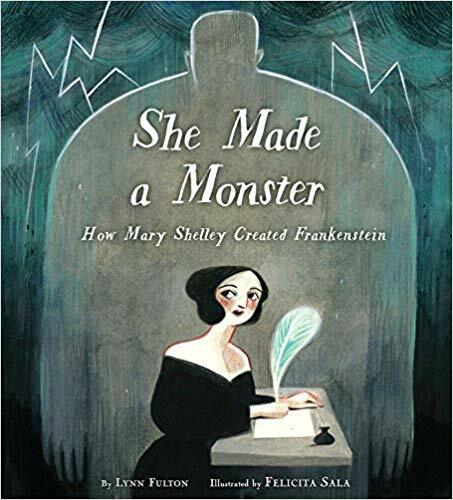 Oh my goodness, the simple illustration style for this surprisingly nail-biting cliffhanger is too perfect, the kind of book you just hold to your chest two-armed and sigh, "that's what a children's book should be." It doesn't matter if it's January. Trick-or-treat yourself. 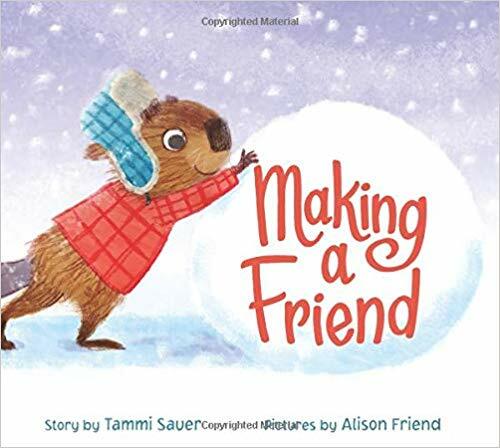 Making a Friend by Tammi Sauer, illustrated by Alison Friend (Harper). Beaver is trying to widen his social circle, but keeps making well-meaning faux pas. 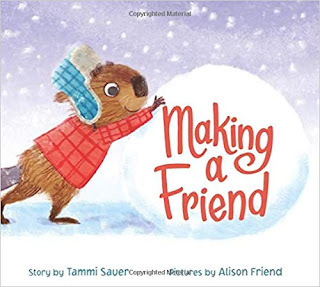 Finally, he abandons his efforts in lieu of creating a perfect partner of his own snowy invention, only to find a like-minded raccoon whose friendship may outlast the season. Lots of modeling of kind words and a theme of perseverance coupled with adorable cartoon illustrations make for storytime perfection. You can never have too many really good snowman books in the cooler, and this one will defrost any midwinter read-aloud slump. Baby Monkey, Private Eye by bestselling and award-winning author Brian Selznick and David Serlin (Scholastic). A beguiling little monkey rouses himself repeatedly from nap time to locate missing items for a series of increasingly surprising clients. Artful historical references and visual jokes are tucked in throughout for the recognition and entertainment of all ages, but this fills a special need for emergent readers; an entirely accessible early reader with some heft to it, short "chapters" overflowing with confidence-building visual cues and repetitions and belly-laugh humor, and through it all one of the most striking homages to Maurice Sendak I've seen in a long time, black and white line illustrations and comic book interjections hearkening to Higglety Piggelty Pop! and Some Swell Pup. Gone, but not forgotten. 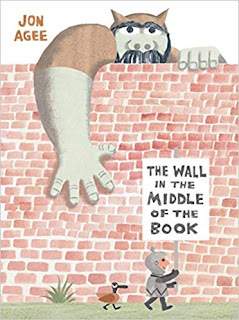 The Wall in the Middle of the Book by Jon Agee (Dial). Tension builds as a headstrong little knight insists on staying on his side of the edifice out of concern of what is on the other side even when the danger on his own side is clearly and hilariously growing. It's funny, or maybe unfunny, because it's true. Sigh. John Agee is known for a tongue-in-cheek and subversive twang in his books, but even without the undertones of any grown-up debate, what I like best about it is how it draws attention to the middle seam (or "gutter") of the book, and how John Agee had to really think about the layout of this physical book to create it, it's part of the story. Books that afford the chance to look at parts of a book are a boon. Can I Be Your Dog? 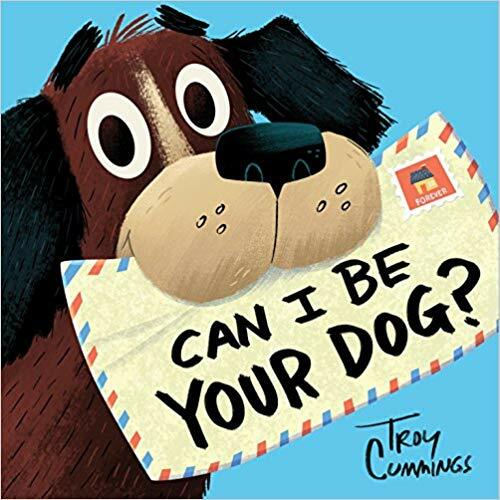 by Troy Cummings (Random House) Arfy is a stray looking for a home, and sends each house in the neighborhood a letter alerting them of such. Poor Arfy is thwarted at every turn, ultimately retreating to a cardboard box in a rainstorm...until the mail carrier makes a proposal of her own. I'm not crying, you're crying! Naturally, this book has extensions for letter writing and persuasive writing, but not to be overlooked is the superior storyboarding going on here, building tension wonderfully until its satisfying twist. 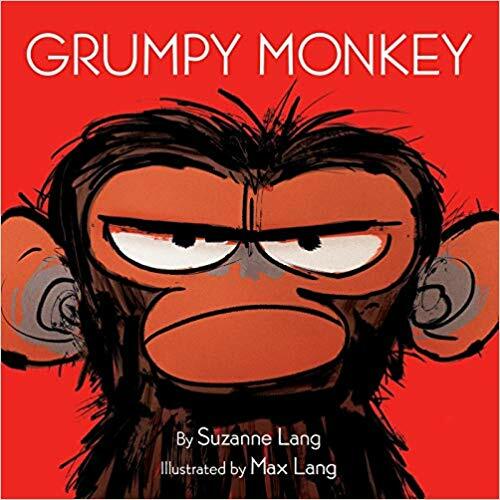 The illustrations are big, bright, well-paced, comic and uncluttered, perfect for sharing. Starting from the front end-papers like postage stamps with themes a dog would love (a hydrant, collar, squirrel to chase) to the last end-papers (A double-page spread of the neighborhood and hints for helping homeless animals), this book will win the hearts of children and teachers alike, and deserves to win even more. Go fetch. And FYI, for an extension, additional animal-themed correspondence from this publishing year may be found in Love, Agnes: Postcards from an Octopus by Irene Latham, illustrated by Thea Baker (Millbrook). How about some people letters? 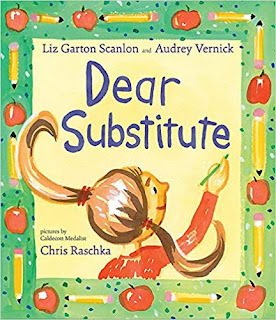 Dear Substitute by Liz Garton Scanlon, illustrated by Audrey Vernick, illustrated by Chris Raschka (Disney Hyperion). A little girl is thrown when her routine is interrupted by a teacher's sick day, expressed in a series of hilariously curt notes to inanimate and conceptual items in the school ("Dear Line, /Yes, I do know I'm supposed to be line leader this week, /Especially since I was chair stacker last week. /I'm sorry You-Know-Who doesn't know how we do things in Room 102.") 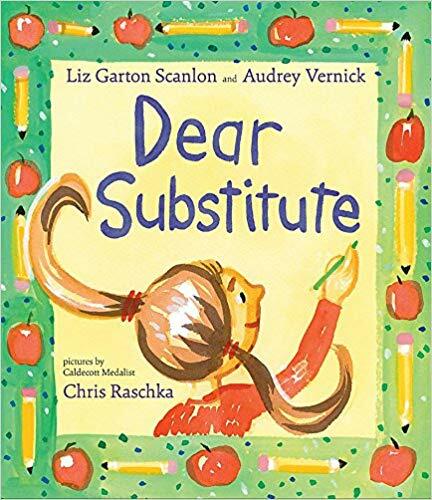 Eventually, the sub convincingly wins our narrator over with some well-chosen poetry, and it turns out she doesn't mind if her regular teacher needs another day to recover. 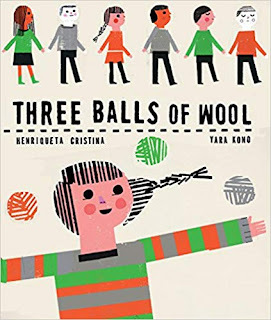 More than a strong mentor text, emotionally sensitive, honest and clever in conceit, this is a wonderful book to leave for a substitute in your absence or share for a read-aloud in your presence. 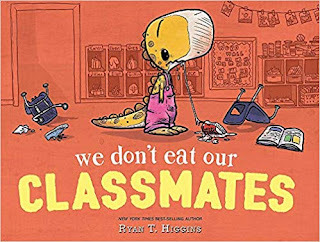 Another classroom-themed favorite of the year is We Don't Eat our Classmates by Ryan T. Higgins (Disney Hyperion), in which Penelope T. Rex is new to and nervous about the school experience, exemplified by her ingestion of her classmates (don't worry, Mrs. Noodleman has her spit them out). Penelope is lonely, but her father explains, "Sometimes it's hard to make friends...especially if you eat them." This should be enough food for thought for Penelope to adjust...this book could, but doesn't, stop there. Not until the class pet, a goldfish, puts Penelope in line does she realize that we shouldn't dish out what we can't take. Revenge is a dish best served a la dinosaur. Oversized illustrations are great for group sharing and are full of hilarious facial expressions and clever detail. Fans of Jon Klassen will appreciate this story's edge, and so will students with a sense of humor. Some other strong back to school offerings this year are Twig by Aura Parker (Simon and Schuster), in which a stick bug at a busy bug schools finds her camouflage hinders her friend-making, The Day You Begin by Jacqueline Woodson, illustrated byRafael López (Nancy Paulsen Books), Mae's First Day of School by Kate Berube (Harry Abrams), in which first day jitters send a student up a tree, Fairy's First Day of School by Bridget Heos, illustrated by Sara Not (Clarion), a twee back-to -school how-to suitable for the Fancy Nancy set and Did You Hear What I Heard? Poems About School by Kay Winters, illustrated by Patrice Barton (Dial). Every Month is a New Year by Marilyn Singer, illustrated by Susan Roth (Lee & Low). 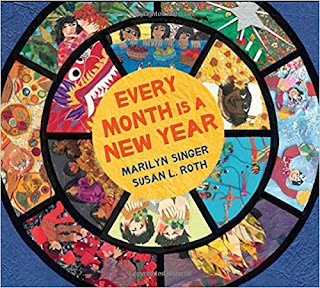 This book of poems showcases celebrations welcoming the new year from somewhere around the world, one for every month. This is a multicultural book with some real meat on the bones. You will not be able to read it without learning something new, and extensive back-matter wants for nothing; in sharing with children, I advise introducing using the descriptions of the celebrations in the back before sharing the poems, because there is so much new vocabulary and such a rich opportunity to explore each place. I am a long-time fan of Susan Roth's cut paper collages, but this recent offering has detail, vibrancy and energy that suggest a real labor of love and career chef d'oeurve, and has a definite "wow" factor. 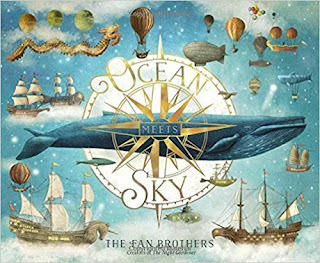 The book pages turn like a calendar and is laid out as such, and can be read at once but might be better served in the classroom as delight in small bites to look forward to every month. Every teacher should have this book. 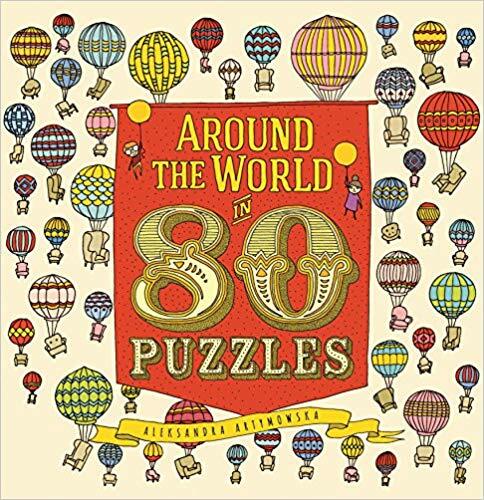 Finally, inspired by the movie Around the World in 80 Days, we have the beautifully illustrated and oversized Around the World in 80 Puzzles by Aleksandra Artymowska (Big Picture Press). 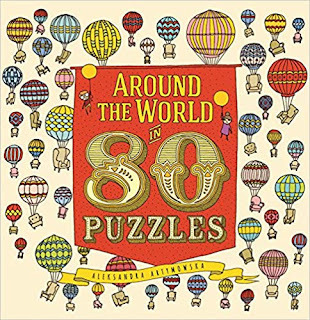 Sometimes, like in Walter Wick's I SPY books, we just lust for a title that children can privately pore over the pictures for hours in the world of a beautiful game. Here you go. That makes thirty-one new book recommendations. Or thirty three. Or is it thirty seven? I'm an elementary school librarian, not a math teacher, so if numbers don't involve Dewey Decimal or measurements to bake cupcakes, I'm never quite sure. 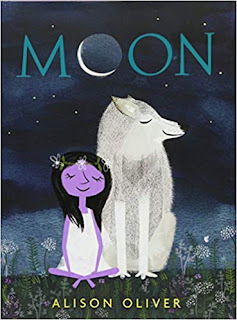 What I am sure of is that there is a book in this list that will connect with and enthrall a young reader in your life, and I thank you for sharing it. I can't count very well, but I can read. As I write this post and think of all the reviews and recommendations and resources out there, it occurs to me that there's still nothing quite like examining a book in hand! 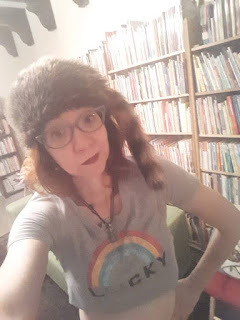 To that end, if you are in the Chicago area, please friend me on Facebook to keep apprised of upcoming Cookie Bookie gathering and Silent Reading parties I will be hosting through the year to afford you the opportunity to do just that, or build your collection and host your own! This post is dedicated with love to the late and very great friend, mentor , reader and inspiration Agnes Royer, the "Story Lady" who was the voice for Fun for Kids, the longest running children's radio show in America out of Ketchikan, Alaska. You made a world of difference. Links are provided for information. Please support your local independent bookseller.